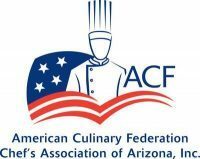 bylaws of this chapter and the American Culinary Federation. Culinarian with at least three (3) years full-time employment in the culinary profession. Culinarian not involved in the management or supervision of staff, minimum six (6) months full-time employment. Student or apprentice currently in the culinary field and less than two (2) years’ work experience. High School student between 16-18 years of age. A representative of a group, company or corporation providing products and services to the culinary profession. Offers military personnel membership at a discounted rate. A military membership includes all the benefits of an ACF membership including discounts on certification for military. An individual that is not employed in a culinary field, but has a passion for the culinary arts. Individuals who enjoy cooking, baking, dining at independent restaurants, or who may have their favorite chef on speed dial should join as an Enthusiast.